In an oxbow lake along the middle reaches of the Yangtze River, a breathy sigh pierces the surface stillness as one of China´s most endangered animals comes up for a gulp of hazy air. 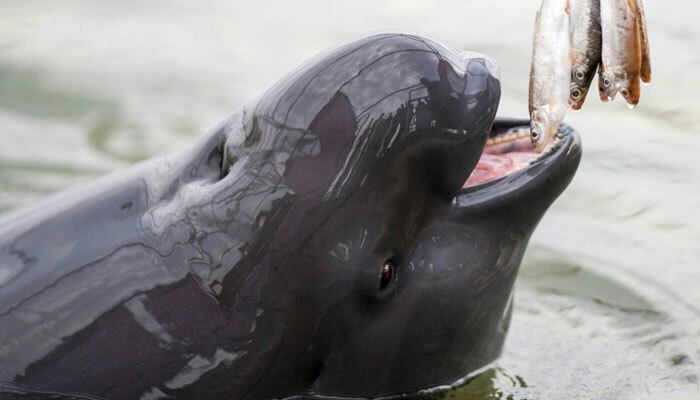 Such glimpses of the shy Yangtze finless porpoise, the only aquatic mammal left in China´s longest river and known in Chinese as the "smiling angel" for its perma-grin, are increasingly rare. Pollution, overfishing, hydroelectric dams and shipping traffic have rendered them critically endangered, worse off even than China´s best-known symbol of animal conservation, the panda. China´s government estimates there were 1,012 wild Yangtze finless porpoises in 2017, compared to more than 1,800 giant pandas, which is no longer endangered. At the Tianezhou Oxbow Nature Reserve in central China´s Hubei province, a curving lake linked to the Yangtze by a stream, around 30-40 porpoises were brought in beginning in the 1990s. There are now around 80. "We found out animals can not only survive but also reproduce naturally and successfully at Tianezhou. That´s very encouraging," said Wang Ding, 60, a porpoise expert with the Chinese Academy of Sciences. Researchers also credit official clampdowns on polluting activities and fish overharvesting, artificial reproduction projects, and growing environmental awareness among China´s emerging middle class. "The voice and supervision of the public has played an important role," said Zhang Xinqiao, the species´ project manager at the World Wide Fund for Nature (WWF). Chinese officials are keen to avoid a repeat of the "baiji", or Yangtze dolphin, the river´s only other aquatic mammal, which since 2006 has been considered extinct in a huge conservation setback for China. One of the world´s few freshwater porpoise subspecies, it is considered a natural barometer of the overall health of China´s most important river. The Tianezhou reserve, established in 1992, claims to be the world´s first and only example of cetaceans -- which include dolphins and porpoises -- surviving and reproducing after relocation. "Look over there, a mother and a baby," Wang said, as his pilot cut their patrol boat´s engine at the sight of two arched backs breaking the silvery surface. The shy mammals quickly submerged. The WWF´s Zhang said the species´ days in the river may be numbered. "As long as danger exists, such as a further deterioration of natural habitat, it´s very likely their numbers could drastically decrease again." "They are saying ´hi´ to us," said Liu Hanhui, a volunteer. "I think they understand human feelings." "Our development has caused a species to rapidly disappear. I feel like I´m atoning for mankind´s crimes," Liu said.